SEO enthusiasts in Ahmedabad, received a chance to be at SEMrush Meetup, discussing key SEO tactics for the coming year. Organized by SEMrush, with TejSolPro as a key partner, the event featured three renowned speakers – namely, Pratik Dholakiya (Co-Founder at E2M), Jaydip Parikh (CEO at TejSolPro) and SEMrush’s very own Global Marketing Head Olga Andrienko. They shared with over 300+ participants an in-depth analysis on the SEO tactics required to fire up their marketing strategy for the coming year. As a top content marketing influencer for three years in a row (as recognized by Onalytica) and as the co-founder of a full service digital agency, Pratik was supremely suited to not just talk about content marketing, but could also explain how to make it succeed in 2018. From deciding on the length of content to promoting it, he told an enthralled audience everything they needed to know to make their content rank. He also shared the best-kept secret in off-page SEO: guest blogging, and highlighted the major role it will play in link-building in the coming year. Jaydip, the CEO of TejSolPro is a top digital marketing strategist with more than 15 years of experience in marketing and digital strategy under his belt. As an active speaker, both online and offline, it was no surprise that he could effortlessly cover the most important local SEO techniques for businesses. He stressed the importance of voice search and how ‘Rich Snippets,’ ‘Paid Ads’ and ‘Near Me’ searches will change advanced SEO practices. Since Google can now predict the kind of information that searchers will need, optimizing for both long-tail keywords and conversational search queries will help you nail local SEO, he concluded. Not all marketers find it easy to conceptualize and execute a social media strategy that works. Who better to explain it than Olga – the Head of Global Marketing at SEMrush, who has built one of the strongest international communities in the online marketing industry! Olga explained how to not just reuse content, but also how to make it successful on social media. She also deconstructed influencer marketing and offered actionable tips on handling burns and unhappy reviews on social. Since social media is fundamentally visual, she also gave the audience a social media tool kit that included recommendations for apps and platforms you will need to be a successful social media marketer. In short, it was an information-packed session that was hugely successful – as evidenced by the 250+ marketers who tweeted about it. In fact, #SEMrushmeetup was trending on Twitter in Ahmedabad on January 12. “We are overwhelmed by the participation and reception our SEMrush event has received here,” says Julia Aslamova, the event organizer. “The audience engagement and the scale of the event was mind-blowing, and we want to thank everyone for making the event the success that is was” she continues. 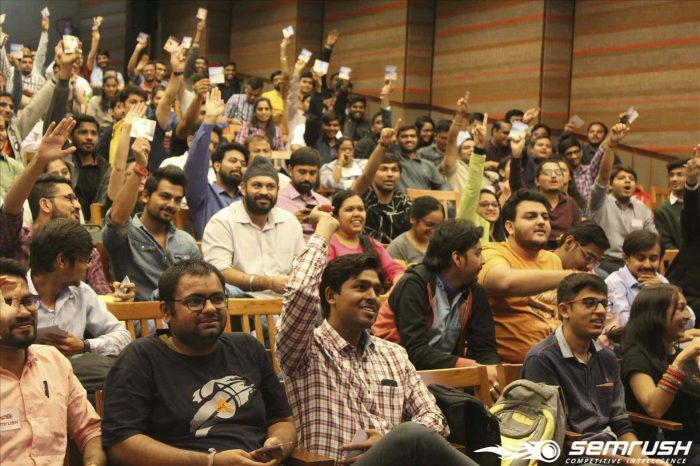 She firmly believes that such events not only help participants keep in touch with current best practices, but it also provides a unique platform for discussion – with like-minded SEO enthusiasts. More importantly, it brings together industry experts and beginners alike, thus enabling a spirited and well-informed discussion, which would otherwise not be possible. Needless to say, the speakers helped make it so meaningful. “We are deeply grateful to them for not just making the time and effort to be here, but also for genuinely engaging on a one-on-one basis with the participants,” says Julia. “It is what makes our Meetups so uniquely value-adding”. Encouraged by this tremendous success, the SEMrush team has planned meet-ups across India in Delhi, Mumbai, Pune, Hyderabad and Ahmedabad in the first week of March,2018. In case you miss them there, you can always catch up with the team at the AdTech on March 8-9,2018 in Delhi. Join the SEMrush community in India for the latest updates on future events so that you don’t miss out!